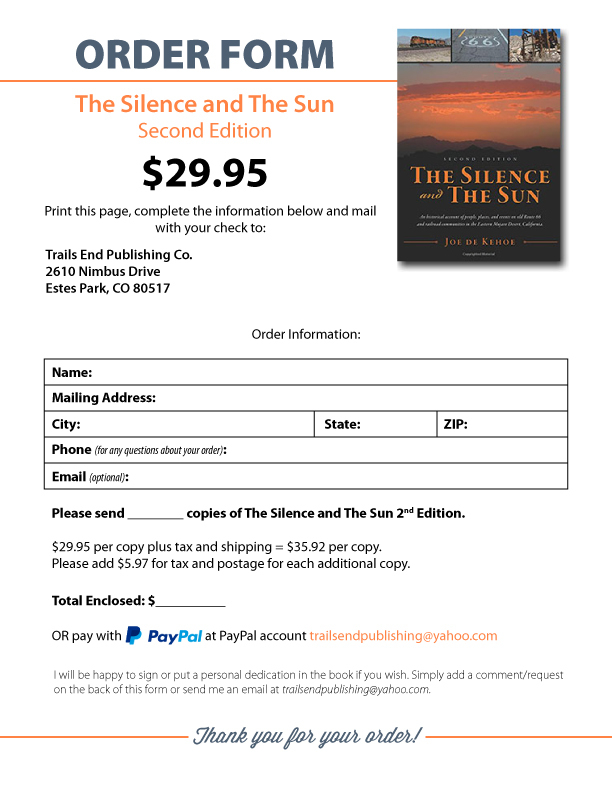 The second edition of The Silence and The Sun was out of print for roughly a year, but because of continuous demand for the book and continued interest in this part of Route 66 through the Mojave Desert the book is back in print and available for purchase either directly from the author at Trails End Publishing Co. or from one of the retailers listed below. ﻿Click the button on the right to download an order form or email Trail's End Publishing Company at trailsendpublishing@yahoo.com . To reach Joe directly, fill out the contact form here. You may also order via PayPal at the PayPal account trailsendpublishing@yahoo.com. ​Illustrated with hundreds of images and maps!